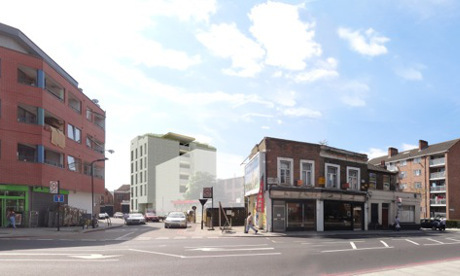 A second ‘pocket flat’ development scheme aimed at Hackney’s middle-income workforce has been granted planning permission on the site of former cabaret pub the Deuragon Arms. Award-winning developers Pocket Living were awarded a huge chunk – £21.7 million – of the Mayor of London’s covenant scheme to roll out the compact one-bedroom homes across 8 London boroughs. The 29 flat development on Rosina Street in Homerton will be Hackney’s second Pocket Living scheme and follows the 28 homes currently under construction at Marcon Sqaure near Hackney Downs. 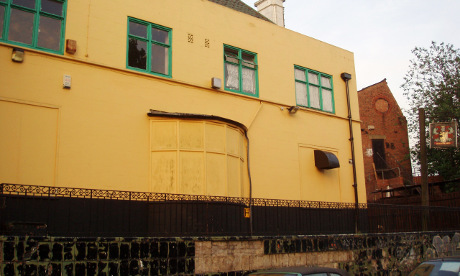 The now derelict Deuragon Arms, which closed its doors over ten years ago, once had a reputation as one of the best musical pubs in the East End featuring performers such as female impersonator Gay Travers and cabaret star Ray Martine. ‘The Deu’, as it was known to locals, will be demolished to make way for the compact 400 sq ft flats, specifically designed for first-time buyers with incomes of under £66,000 a year. Pocket homes are sold at 20% discount to open market rates and are never priced over £230,000. Pocket Home owners cannot rent out their homes for investment purposes and are compelled to sell the flat on to those under the £66,000 salary bracket. But key workers will still need deep pockets to come up with the £40,000 deposit. Pocket Living developments do not include any homes for social rent and do not match the council’s preferred tenure mix. Hackney’s most urgent housing need – that of affordable large-scale units (family homes) – will not be met by the development. However the developers have been able to negotiate on quotas as, according to the council, Pocket qualifies as a “niche product’. A spokesperson for Pocket Living said: “Our mission is to keep young working people – we call them city-makers – living in London. Pocket is the only developer in London focused on delivering low cost home ownership. “We provide modern, quality housing to the growing group of working Londoners on low to moderate incomes, who are priced out of the private market, but earn too much to qualify for social housing. Cllr Philip Glanville, Cabinet Member for Housing, said: “The launch of these new homes in Hackney by Pocket is a welcome addition to our partnership working as a Council to develop more, and varied, home ownership options for Hackney residents. Priced Out, a London-wide charity who campaign for affordable housing said the schemes were an interesting approach.